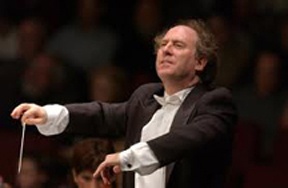 Jeffrey Kahane is conducting his final concerts after a 20-year reign as Los Angeles Chamber Orchestra music director. This image was the printed program cover; a framed copy, signed by the orchestra members, was presented to Kahane last night. This weekend, Jeffrey Kahane is bidding the Los Angeles Chamber Orchestra adieu after 20 years as its Music Director, although he will remain as Conductor Laureate. Based on last night’s performance at the Alex Theatre in Gledane, he’s doing it with what might be called a quintessential Kahane program — a first and two lasts: a world premiere, Mozart’s final piano concerto, and concluding with a work that some might consider beyond the scope of a chamber orchestra: Schubert’s Symphony No. 9. It might also be thought of as two firsts and a last, since this weekend marks LACO’s initial performances of Schubert’s “Great C-Major” Symphony. Originally the program called for Christopher Cerrone’s premiere and the concerto to be the first half with the Schubert as the sole post-intermission work. However, as is often the case with today’s young composers, Cerrone’s 12-minute work — Will There Be Singing — came loaded with percussion instruments, so Kahane elected to open with the concerto and save Cerrone’s new piece until the second half. The idea was to make for more seamless logistics, but it didn’t work; Kahane had to wait a few moments while the final percussion instruments were removed and the trombones came scurrying onstage. The only real problem was that this decision unbalanced the program from a timing point of view. The concerto lasted just under 30 minutes while the second half, including 10 minutes of congratulatory speeches and a bubbly encore, Johann Strauss Jr.’s Overture to Die Fledermaus, ran three times that long. At any rate, the concerto — No. 27 in B-flat major, K. 595, the final piano concerto Mozart wrote and also the last one he played in public — proved to be the evening’s highlight, at least to this critic. Conducting from the keyboard, Kahane balanced his orchestral forces expertly and delivered a pristinely elegant performance of the solo part, reminding us all that he began his career as a prize-winning pianist and continues to play beyond that level. It began with five minutes of ringing chords, continued with five minutes of minimalistic-style music that would have been appropriate for a movie sound track, and concluded with a couple of minutes that fused the two concepts together smartly. Kahane conducted the piece with vigor, the orchestra played it stylishly, and the audience gave the composer a warm reception when he came on stage. During the past two weeks, Gustavo Dudamel and the Los Angeles Philharmonic have led audiences through the first six Schubert symphonies (the last two are being played this weekend), showing how Schubert matured as a symphony composer even in just a few years. Kahane elected to emphasize Schubert’s looking-backward element last night, delivering a performance would have sounded perfect in a Viennese salon but which offered little (to these ears) that looked ahead to the Romantic-era composers spelled out by Gengaro. That’s a perfectly acceptable way of performing this work and, indeed, it seemed to accentuate appropriately the DNA of LACO’s 49-year existence. Kahane was fully in command throughout last night — oddly enough, he used a score during the second and third movements but not in the first and fourth — delivering brisk tempos that brought the performance in at 48 minutes. The orchestra was at the top if its collective game, playing with elegant refinement that began with the wistful horn solos by Gabriel Kovach to open the work. It has, and we all have much for which to be grateful, not least is that Jeffrey will be staying in the area, maintaining ties with the ensemble and mentoring new artists as Professor of Keyboard Studies at the USC Thornton School of Music. • This was the seventh LACO performance of Mozart’s K. 495 concerto. Others performances were led by Sir Neville Marriner in 1977, Gerard Schwarz in 1985, Christof Perick in 1989, Ignat Solzhenitsyn in 2007, and Kahane in 2008 as part of his cycle of all 27 concerti played during the 250th anniversary of Mozart’s birth. • The printed program noted that since he became music director on July 19, 1997 Kahane has conducted 519 distinct musical works (172 from the keyboard), led 430 individual concerts, and given 154 chamber-music performances. That’s a tough legacy for his successor to follow (the search is ongoing). This column ran in Sunday’s print editions of our papers. May will be a bittersweet month as two groups bid farewell to their long-time music directors. John Alexander will step down from his post at the Pacific Chorale after that ensemble’s final concert for the season on Saturday at the Renée and Henry Segerstrom Concert Hall. 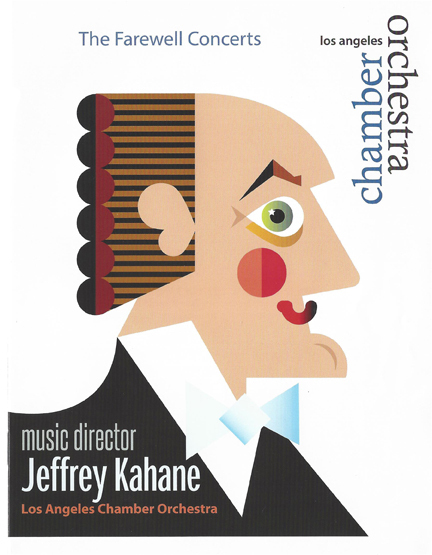 The following weekend will be Jeffrey Kahane’s last concerts as Los Angeles Chamber Orchestra music director. Both will stay on in Conductor Laureate categories, but their full-time involvement will cease this month. Alexander (pictured left), who has been at the musical helm at the Pacific Chorale for 45 years, has assembled a collection of favorite anthems for his final program, which will conclude with Vaughan Williams’ Symphony No. 1 (“A Sea Symphony”), a rarely performed work but one of the English composer’s best symphonies. The Pacific Symphony and soloists Layla Claire, soprano, and Brian Mulligan, baritone, will join in the Vaughan Williams. Kahane has led LACO for 20 years. His final program, on May 20 at the Alex Theatre in Glendale and the following night in UCLA’s Royce Hall, will feature a first and two lasts: the world premiere of Will There Be Singing by Christopher Cerrone, LACO’s first performance of Schubert’s last symphony, No. 9, D. 944 (“The Great C-Major”), and Mozart’s final piano concerto, No. 27 in B-flat major, K.595, with Kahane playing and conducting from the keyboard. Both men have led their groups to new heights during their respective tenures. Alexander took over the reins of what was then known as the Irvine Master Chorale in 1972, just four years after Maurice Allard founded the ensemble as the Irvine Community Chorus. Now with 140 professional singers, the Pacific Chorale has been Segerstrom Concert Hall’s resident choir since the hall opened in 2006. Texts have also been critically important to Alexander’s conducting style, so it’s no surprise that his final concert concludes with Vaughan Williams’ “A Sea Symphony,” which uses texts from American poet Walt Whitman. The four-movement work, first performed at England’s Leeds Festival in 1910, opens with a bang — a full-throated chorus singing the line, “Behold, the sea itself!” — and concludes nearly an hour later with the final notes, “O farther, farther sail,” evaporating into the mists of the sea. Paul Hodgins’ Orange County Register on Alexander and his successor, Robert Istad, is HERE. Kahane (pictured right) took over LACO in 1997 a couple of years after Christof Perick abruptly resigned the position. It was a troubled time for the orchestra, which was still recovering from formidable financial issues. Kahane was far-better known as a pianist — he won the prestigious Artur Rubinstein International Piano Competition in 1983 and was building a flourishing concert career. However, in 1995 Kahane became music director of the Santa Rosa Symphony in Northern California and two years later the LACO board gambled on his, and its, future by naming Kahane as its new music director. That bet paid off in spades, as LACO has grown and prospered under Kahane’s leadership to the point where it now has orchestral, chamber music and baroque series annually and is one of the nation’s premiere chamber orchestra. 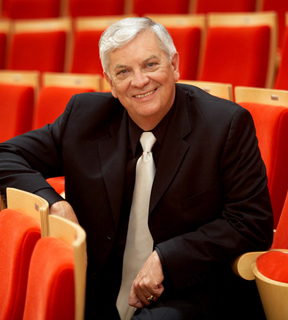 One difference between the two groups is that the Pacific Chorale has already named Alexander’s successor: Robert Istad, who nine years ago took over when Alexander retired as Professor of Music and Director of Choral Studies at California State University, Fullerton. On the other hand, LACO continues to search for Kahane’s replacement. This review ran in print editions on Sunday, May 7. Beethoven’s Symphony No. 9 is one of his best-loved works. It would probably be his most-performed piece if it didn’t require a choir and four soloists, along with the orchestra. As a testament to its popularity, even with four performances of this “Choral” symphony within the span of a week all were nearly sold out. On April 22 and 23 the Los Angeles Chamber Orchestra used Beethoven’s Ninth as the penultimate concerts in Jeffrey Kahane’s 20th and final season as LACO music director. On April 29 at Ambassador Auditorium, David Lockington programmed the work in the final two concerts of the Pasadena Symphony’s 88th season. Although the symphony was the same, there were significant differences in how the famous piece was presented. For several years Kahane curated an annual non subscription “Discover” concert at Ambassador Auditorium where he spent the first half of the program analyzing the chosen work (usually a Beethoven symphony) with snippets played by the orchestra and the second half conducting the work in its entirety. LACO’s performance of Beethoven’s Ninth at the Alex Theatre in Glendale turned into such an evening, but apparently no one outside of the organization was told ahead of time (it certainly never appeared in any of the marketing materials). The post-intermission performance at the Alex was stunning. Kahane balanced his forces (57 instrumentalists, 48 choristers and four soloists) expertly and his conducting reflected the passion of his lecture, especially in the “Adagio” movement that he conducted without a baton and used his hands to sculpt phrases lovingly. There was a sense of urgency to nearly all of his tempos and the entire work clocked in at just 65 minutes (about 10 minutes less than some conductors use). The Master Chorale sang with precise diction and uniformly excellent tone. The orchestra’s reduced numbers enabled many of the inner instrumental voices to shine clearly. The four soloists were also balanced expertly and placed on the front of the stage. Justin Hopkins’ clarion baritone voice was perfectly matched to the O Freunde opening, soprano Kathryn Mueller delivered a clean, bright sound and elegant, tenor Paul Appleby rose above the orchestra clearly, and mezzo-soprano Susanna Guzmán filled out the quarter expertly. Lockington elected to pair two choral works in the first half of the Pasadena Symphony concert, which I heard in the afternoon. In the first piece, the Donald Brinegar Singers and JPL Chorus joined the orchestra for Vaughan Williams’ Serenade to Music. The Los Angeles Children’s Chorus then took to the risers and, with the help of a quartet of instrumentalists (including Lockington playing cello) sang Holst’s Choral Hymns from the Rig Veda, Op. 26, Group III. Led by LACC Artistic Director Anne Tomlinson the chorus produced its typically sweet tone and sensitive musicality, but its positioning at the rear of the stage occasionally made the choristers almost inaudible from a mid-orchestra level seat. Lockington’s concept of Beethoven’s ninth was more low-key than Kahane’s but was, nonetheless, propulsive — it clocked in at just a minute more than the LACO performance. Aside from a few articulation issues, the Pasadena Symphony delivered a brisk, first-rate account of the work but no sparks flew for this listener. The stage was packed (the violins teetered at the very front edge of the stage). The combined Brinegar/JPL choristers were placed in the rear and they often seemed to be singing from another county in the “Ode to Joy” section. However, they warmed to their task and reached an appropriately majestic conclusion. The soloists — bass Steve Pence, soprano Summer Hassan, mezzo-soprano Tracy Van Fleet and tenor Arnold Livingston Geis — were positioned to the left and behind the orchestra and thus were at the disadvantage of trying to be heard over the instrumentalists. The one unusual touch in the performance was to have the LACC choristers file in during the fourth movement and line up on the floor in front of the stage to sing one of the “Ode to Joy” verses. It made for a nice generational touch.